Over two hundred years ago when the United States was first being built, things were far different than they are today, from the clothes people wore to the technology available to the language they used in everyday conversation. But most people don’t realize that the food they ate was also very different. Granted, we continue to eat a lot of the same foods, but many of the foods people ate back then would be considered absolutely disgusting nowadays. Nonetheless, people back in those times had to make do with whatever was available, which is why they ate many of these foods. If you find yourself in a survival scenario where food is scarce, even the strangest foods might start to look appetizing. 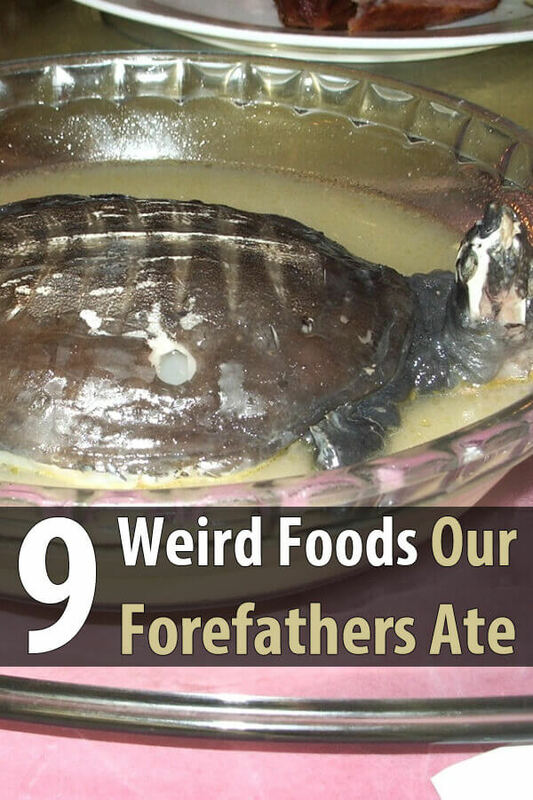 Let’s look at nine of the weirdest foods people used to eat. While roast beaver tail may seem like a rather unappetizing ‘delicacy’ today, back in the 1700s it was a favorite food among European trappers and Native Americans. The reason was because people living and traveling in the mountains needed food that offered plenty of fat, nutrition, and calories. Not only was beaver tail exceptionally nutritious, it was also widely available. When trappers and Native Americans trapped beavers for their pelts, they would also take the tail for food and roast it over an open fire. Roast beaver tail remained a common dish in the American wilds until about the 1940s. While squirrels are still occasionally captured and eaten today, particularly in the Appalachian Mountains in the East, they were commonly eaten by city people in the 1700s to 1800s. The reason why, as with beaver pelts, was because squirrels were simply so common that there seemed little reason not to eat them. Squirrel meat saw a brief resurgence in popularity during the Great Depression when people became desperate for meat, so they naturally turned to what was very plentiful and easy to find. Sassafras is a leafy spice with a pungent taste that is uncommonly still eaten today in Creole cooking. Back in the 1600-1700s, however, it was one of the most common and valuable spices in Colonial America, with only tobacco being more popular. The reason sassafras was so popular–despite its foul taste and smell–was because people believed it had strong medicinal properties that could heal a number of different diseases. Recently, science has shown that these properties are considerably weaker than the people at the time believed. If you’ve never heard of clabber before, it’s essentially the 1700s version of yogurt, only infinitely worse. Essentially, it is raw milk that was left to go sour at a room temperature so it could thicken before being eaten. People ate clabber much as we eat yogurt today and in largely the same way. Not only did people eat plain clabber on its own, they also included it as an ingredient in many baking recipes. Today it’s rare for people to eat eel meat other than in certain sushi recipes, but back in the day (as in the 1600s and 1700s), it was a regular staple for Americans living along the East Coast. Eels were plentiful in places such as Cape Cod or the Carolinas, so people would harvest them like crazy and then use the meat in a variety of different meals. One such meal was ‘old eel pie,’ where the meat of the eel would be mashed into a jelly-like substance and slathered over bread or pie crust to make, well, old eel pie. People’s interest in this delicacy waned when the eel population began to drastically shrink and they turned to other seafood sources such as fish or lobster (both of which were commonly used as bait for the eels in the first place). By tongue, we’re referring to the tongue of virtually any mammal that could be found in North America, whether it be deer, elk, bear, cows, or whatever. Animal tongue was prized for being tender and juicy, and it remained a popular food choice until the late 1800s. Today, beef tongue can still be found in certain shopping marts, though it’s not nearly as common as it once was and, if anything, comes across as nauseating rather than appetizing. Moose were once a very abundant animal that roamed all four corners of North America. Naturally, it was one of the primary food sources for people who journeyed west, and they made sure that not a single edible part of the moose went to waste. This even included the nose, which would be boiled then either cut into thin slices or mashed into a paste and eaten. People made sure to remove as many of the nose hairs as possible before boiling, which alone was a very arduous and not to mention disgusting task. Turtles were once a very common food source along the East Coast and in the rivers and streams of New England. Though today we like to think of turtles either as pets or as sympathetic animals that are compelling to watch in their natural environments, back then the meat of the turtle would be roasted and then included in thick soups. But as with beaver and eels, turtles became over-harvested to the point where their population numbers shrank dramatically, so people moved on to other sources of food. One of the most common drinks in Colonial America, before the advent of drinks such as beer and whiskey, was perry. It’s made from the fermented juice of pears, which were commonly available. While perry undoubtedly had a sweet taste that made it so appealing, it also produced unwanted bowel movements that naturally led to biological problems. Turtle soup is widely available in South Louisiana. It looks absolutely nothing like this illustration (more like a gumbo) and is wonderful… especially with a tablespoon of sherry on top. I live in France, and here, tongues (beef, cow, sometimes pork) are still available in supermarket either raw or in cans. The biggest problem is cooking time. It takes around 3 hours of boiling for beef or cow tongue while adding potatoes, cabbage, leeks, carrots, thyme, laurel, etc… Then you have to peel it before serving it in slices. I wouln’t consider it something to eat on the road but later on when you’re settled it is nutrious and, yes, a very good dish. When my mother was young, it was considered a delicacy fit to be served on a wedding table. You can also find it in fine restaurants. My father loved picked heart & tongue. You must pickle it in vinegar to make it tender enough to eat. We hunted squirrel and rabbit on our property and ate these in several different recipes. Sassafras tea was a regular beverage at the house. We ate turtle soup but it did not look like the picture of the whole turtle. More like the small bowl. My mom still makes tongue. I only eat it when she makes it, silly as it sound I can’t bring myself around to buying or cooking it myself. That and I’d be the only one eating it in my house. I grew up eating skirrel and beef tongue I still love the taste of both.